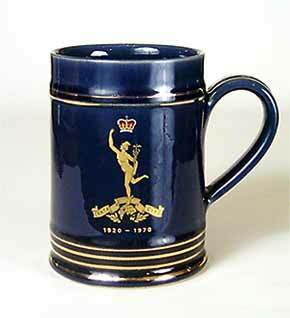 Royal Corps of Signals tankard - 5" (127 mm) high. 1970. This mug commemorates the fiftieth anniversary of the Royal Corps of Signals in 1970. It is the same size and shape as the HMS Jamaica tankard and the Coronation tankards but made nearly twenty years after the latter - note the difference in the design of the handle. These tankards hold an Imperial pint.